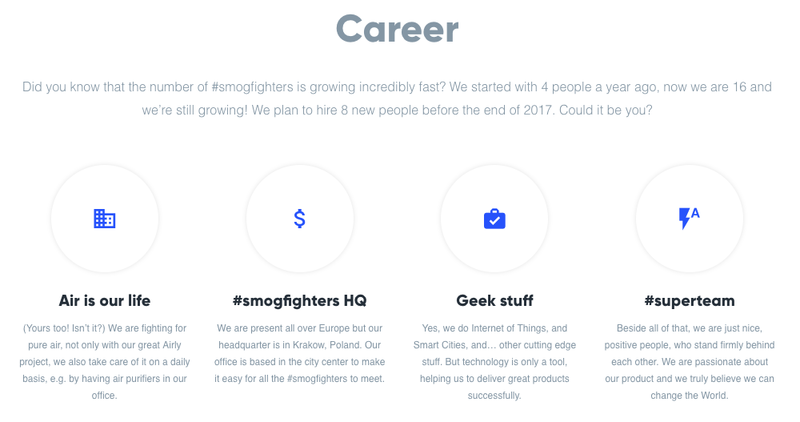 Case study: #Smogfighters — You can save the World with us! It was one of those cool projects: very responsive business partner, you understand each other in a flow, the goal is singular and clear, the product & the team you promote are (really!) changing the World :D — Sounds like a dream? We just made it happen in our cooperation with the Airly team, a.k.a. #Smogfighters! We already knew each other from many startup events across Poland, Airly team was also a finalist at the Global Student Entrepreneurship Awards, a competition we co-organized as Project: People. They contacted us in August this year, we met with Airly CEO — Wiktor Warchałowski, spoke about their needs and problems, [and the rest, as they say, is history]. The need: the Airly team should grow quickly; they should grow their team by 30% by the end of the year. The problem: The Polish IT employment market is very competitive, especially when hiring back- & front-end developers. And Airly team don’t want to compete based on the salary and benefits. They’d love to hire engaged, highly motivated people, whose values are similar to those of the team, people who truly believe their job is influencing reality. Our task was to propose employer branding activities which would help them fulfil their goals. *Sprint = 5 working days during which the team is focussed on one goal and a set of defined deliverables. The whole content was consistent and expressive — the message was really clear. The 1st sprint started on August 21st and the campaign was launched on September 13th, 😮 Waat? We hear you say :) Yes, we did it all in less than one month, and to be honest it wasn’t a project delivered in a hurry. As we mentioned at the very beginning — it was one of those cool projects: everything on time, with no nervous atmosphere, or a push from the client’s side (BTW: Thank you Wiktor!). Obviously, we continued our cooperation — the campaign was designed for 3 months. But the core was prepared and delivered in those 3 weeks. The goal was to hire 5 people to the team by the end of the year — and it was achieved! In fact, it was fulfilled by the end of November, in 2,5 months. Obviously, the result is a combination of many elements and activities. The Airly team provided all kinds of recruitment activities during the campaign, e.g. LinkedIn sourcing, approaching candidates directly, etc. The results are really impressive — they have grown their team by 30% in 2,5 months! Project: People is the lean strategy agency. We are helping our clients to find a right business model, define users and find them, solve their problems & meet their needs. Sounds interesting? Contact us at hello@projectpeople.pl, check our Behance portfolio, and follow us on Facebook!